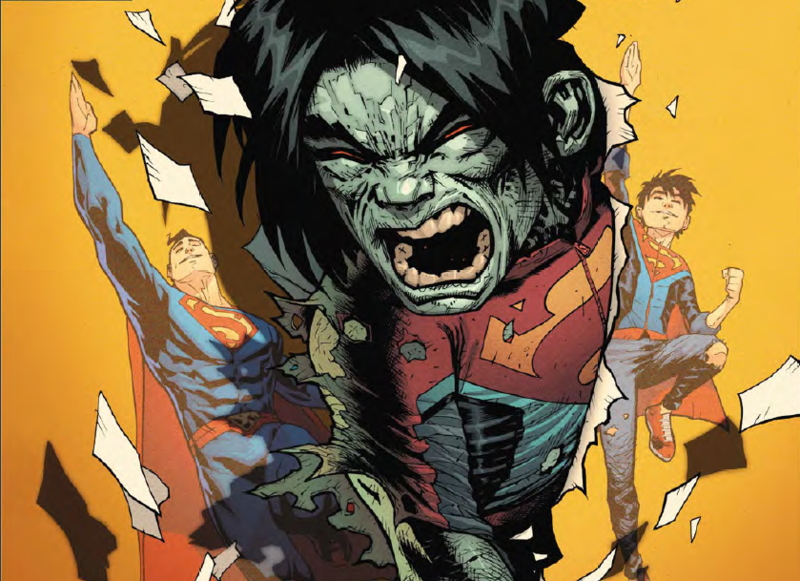 Superman #43 Review – AiPT! Boyzarro vs. Superman, who ya got?! One of the joys of reading Superboy stories is that he’s new to much of what his father, Superman, has seen time and time again. Enter Boyzarro, a not-super boy from htraE who talks backwards but means well. Last issue ended with him breaking into Superboy’s room. Not good. Patrick Gleason and Peter J. Tomasi have been crafting a great all-ages story with Jon and his family. Its also meant they can play a bit in the more silly and zany part of the Superman universe. The plotting of this issue was a big surprise, going in directions I didn’t see coming. One of those directions is how the creative team uses Superman. Instead of reacting rashly, he deals with Boyzarro in a calm way, knowing you have to be patient with these backward selves. The ending is also a big surprise and it’s an effective cliffhanger to draw readers in. If you were excited to see Boyzarro end the last issue you’re going to want to see how Superman can possibly solve this latest quandary. The characterization of Boyzarro is quite good and by the end, you get the sense that he’s growing as a character. There’s something going on in that noggin you don’t see with his father — maybe because he’s young and not set in his ways yet — which adds a layer to the story that’s interesting. The art continues Gleason’s slightly cartoony style you’ll notice most evidently in Lois Lane’s big eyes. There are three full-page splashes in this one, two to show off how impressively strong Superman is, and the third ending the book on a very weird note. These splash pages give the book a bigger feel. If he eats toys does he play with his food? The inks darken things in this issue, almost giving it a horror feel. That’s in contrast to the brightness of the last issue which gave the Bizarro World a fantastical look. The art can also be a bit muddy, possibly due to the inks again, which makes the art pop less than is customary for Gleason. The plotting in this issue is all over the place, opening with Maya and Beacon going toe to toe, only to have things shift dramatically to Jon’s location (from day to night oddly too) and then rushing into some Superman fighting Boyzarro action. Random things seem to occur, like Bibbo showing up (what the?! ), and a Bizarro Damian popping in too. It’s chaotic in a way that’s less entertaining and more fly-by-the-seat-of-your-pants confusing. A good second issue that propels this Bizarro story forward in new and interesting ways.